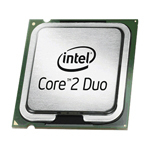 Intel Core 2 Duo series is a dual-core CPU processor that improves on the usage of both available clock cycles and power, and thus reduces the need to extreme high clock speed. This translates into more efficient decoding stages, execution units, caches, and buses, as well as many other factors including lower power consumption. Intel Core 2 processors feature 64-bit Intel64, Virtualization Technology, Execute Disable Bit, SSE3, LaGrande Technology, Enhanced SpeedStep Technology, and Active Management Technology (iAMT2). Core 2 Duo E6300 is lower end of Intel Core 2 Duo processor code-named Conroe with clock speed of 1.86 GHz and 1066 MT/s (266 MHz x 4) FSB with support for DDR2 533. Meanwhile, E4300 is the first of the budget version of Intel Core 2 Duo code-named Allendale processor, which features LGA775 which have 800 MT/s (200 MHz × 4) FSB with support for DDR2 400. Both processors can provide great value for its low price if it’s possible to overclock the dual-core processors for higher performance.